A heavy and a light Manchu bow, unstrung. Author's collection. The Manchu bow, Chinese bow, Qing bow? Commonly called "Chinese bow" or "Qing bow", I prefer to call it the Manchu bow because the design was brought into China by the Manchus when they invaded the Ming empire in the early 17th century. As the Manchus advanced and took control of all of China, the seem to have Chinese seized production of the bows in use by them at that point and switched completely to this "new" design. A likely reason is that all bowyers were instructed to produce Manchu style bows for the war effort and with the wars lasting many decades, they never went back to producing other style bows. As the Manchu bow did completely replace the Chinese composite bow styles during the Qing, there is some justification to the term "Qing bow" as well. We do not know exactly where the Manchu bow originated but it was probably among one of the large game hunting tribes that were part of the Jianzhou Jurchen, the core of the early Qing army. Inspection reports and travel accounts suggest that some Chinese became as good in Manchu archery as Manchus themselves, showing the style of archery and its equipment was embraced by the Chinese as well during the course of the Qing. One caveat though, while the Manchu bow was the standard bow of the Qing, not all archery practiced in the Qing was in fact Manchu archery. Sources suggest that besides the practical Manchu military style, native Chinese styles and concepts of archery endured during the Qing and some Ming archery manuals remained in print. 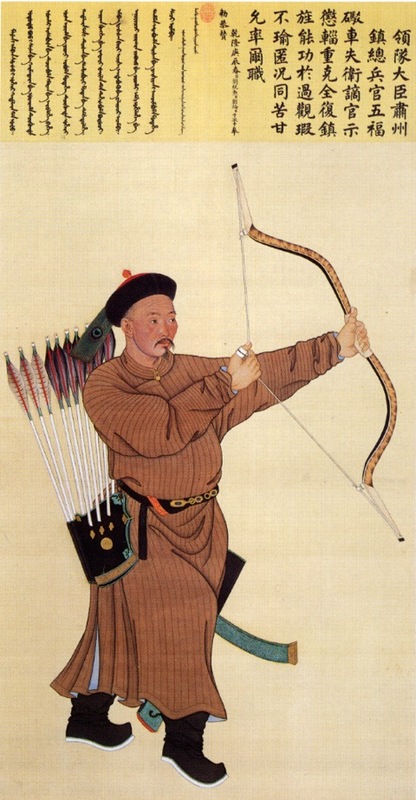 To conclude: The Manchu bow was the standard bow of the Qing, but not all styles of archery practiced in the Qing can be said to represent Manchu archery. Read more about that in my article about technique. A list of bows used in the Ming, compiled by Justin Ma of Cinnabar Bow and the Facebook group Chinese archery. It shows that bows of construction quite comparable to the Manchu bow, called "big-ear bow" were already in use in the Ming, perhaps due to earlier contact with the tribes of the Northeast. The Manchu bow is a member of the family of Asian composite bows. Their are all made with wooden or bamboo core with on either side a rigid wooden ear. The handle section is thickened and stiffened with extra wood and / or horn or bone. Horn is glued firmly to the belly (facing the archer) of the limbs, while animal sinew is glued to the back (facing away). When the bow limbs bend the horn on the inside is compressed while the sinew on the outside stretches, building up potential kinetic energy. Both materials are tougher than wood and thus allow a limb of a given weight to store more energy than a wooden limb would be able to. The reason is that even the best bow woods to not provide such a potential for resisting compression in the belly and extension in the back as the horn sinew combination does. Because of the toughness these limbs can and should bend a lot more than a wooden limb which is why composite bows are almost always made with a deep reflex, have long draw lengths for their length as opposed to wooden self-bows, and come with rigid ears that help bend the limbs further. There is a catch: The rigid ears that make the high degree of bending possible also add dead weight to the construction, weight that needs to be accelerated along with the arrow. Composite bows need to make up for this. Therefore, the longer -and thus heavier- the ear, the heavier draw weight the composite bow needs to be in order to significantly start to outperform a wooden self-bow like the longbow. Once this threshold is reached, they start to outperform wooden self bows exponentially. In a series of tests, Adam Karpowicz put the threshold on about 65 pounds of draw for short Turkish bows with relatively light build. In our testing of a Manchu bow, it seems that the threshold for a well-made Manchu bow is somewhere between 70 and 80 pounds. 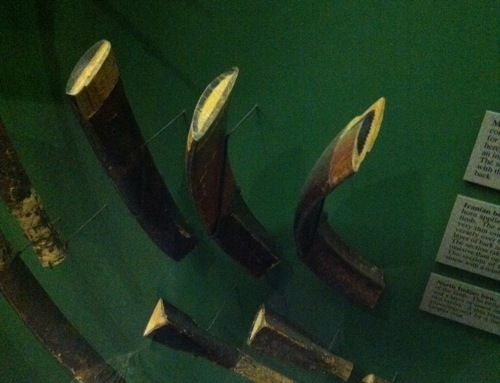 Cross-sections of composite bow limbs. Left Manchu, middle Persian, right northern Indian. Picture taken in the Pitt-Rivers museum, Oxford. 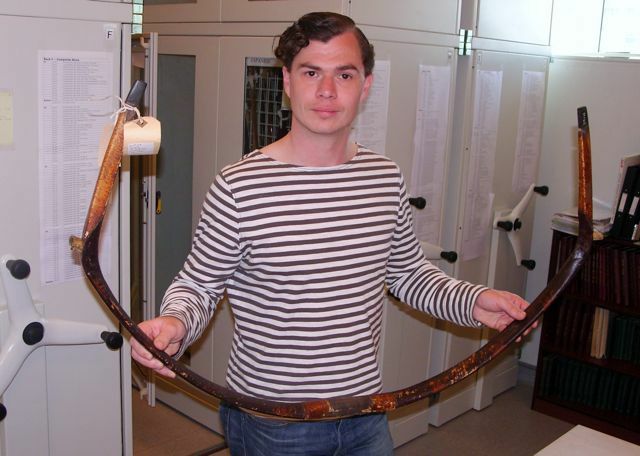 Myself with a 19th century Manchu composite bow made by the Changxing workshop in Chengdu. It was Collected by Ingo Simon and now housed in the Manchester archery collection. Photo courtesy of Richard Hornsby, 2011. The Manchu bow is the largest of composite bows, with rigid ears not infrequently of around 30 cm in length measured from knee to tip. 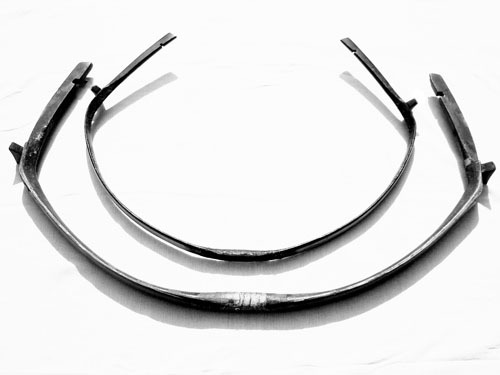 All composite bow ears work as levers to help bend the limbs, and due to their size this effect is most extreme among Manchu bows. This gives the design the flattest force/draw curve of traditional bows. This not only enables the bow to store more energy for a given maximum draw weight, but the flatter draw curve also reduces the need for consistent draw lengths. After all, slight fluctuations in draw length to not result in large fluctuations in arrow velocity and so if effectively solves one of the archer's main challenges: The need for very consistent draw lengths. “The force-draw curve is superior to any modern composite and the stored energy, for a given maximum effort, is probably the highest of any bow that has ever been in general use." A well-made 60 pound Manchu bow of all traditional materials will not outperform a well-made 60 pound English longbow. The Yongzheng emperor stated that from 80 pounds and up is enough for the military, so when Wen Chieh offered to make a bow for me I ordered that poundage. It was only when we tested this bow that the facts and figures started to impress again. At 82 pounds its draw weight started to outperform the disadvantage of the weight of its ears, results were impressive. The 82# Manchu bow, made by Wen Chieh, outperformed a well-made 128# yew longbow, shooting the same 1230 grains (80g) military weight arrow a stunning 190fps against 170fps for the longbow. This is exactly the reason why the Manchu bow used to have a bad reputation: People were testing low draw-weights that were too low and found no significant advantage in poundage pulled versus arrow velocity to justify its complex construction. The design really is made for war and hunting, to do damage with heavy arrows. They may not be the fastest bow, but no other bow design can launch an arrow that heavy, that fast. There is another catch though, the high initial draw weight of Manchu bows makes them considerably harder to pull than a longbow of the same draw-weight, but at full draw they feel similar again. The force-draw curve graph of the Manchu bow. 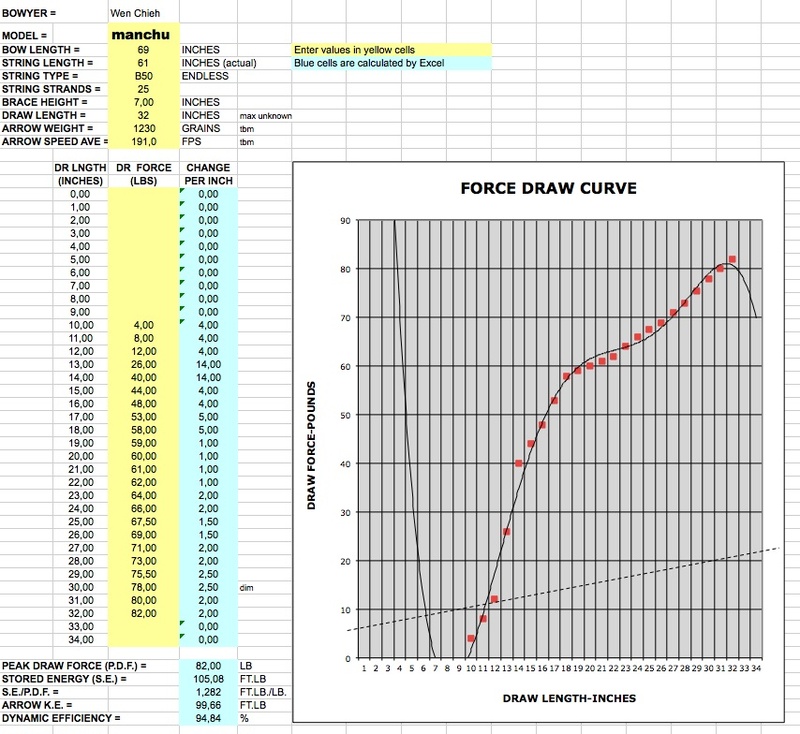 Thanks to Jim Thorne of www.buildyourownbow.com for providing these handy force-draw curve graphs for the archery community. Thanks to Magén Klomp for stringing, measuring, pulling, and shooting the bow. Lacking anyone who can shoot this draw weight with a Manchu ring, tests were done with three finger release. It is the high amount of stored energy in the Manchu bow, caused by the long rigid ears that act as levers to help the archer bend thicker, stronger limbs than he would normally be able to pull back, that makes this possible. The heavy ears do have a negative effect on the bow's acceleration: It will not shoot a light or medium weight arrow very fast but will not be slowed down much by launching a heavy arrow either. This makes the bow well suited for anything that required the use of heavy arrows: warfare and large game hunting. Heavy arrows offer a high degree of penetration through layers of protection (war), increased damage by heavy broadheads (hunting) and increased immobilizing effect due to the arrow's weight (both). Focusing on high damage with large projectiles, it is unlikely to ever win a flight shooting competition against, say, Ottoman or Korean style bows that are primarily built with speed in mind. But when a Manchu arrow strikes within its effective range, it strikes with greater force. 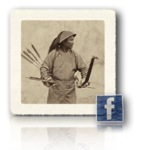 As with most highly specialized equipment, the traditional Manchu composite bow is not easy in use. First, its long ears require a higher degree of straightness than most composite bows, a class know for its susceptibility for twist to start with. This begins in the manufacturing process but also demands some diligence of the archer to maintain. If the ears are too much out of alignment the bow may unstring itself and snap back in its original C-shape, possibly getting damaged and potentially dangerous for the archer and bystanders. (A 100 pound bow was said to be able to kill a bull if it came unstrung.) Thus correcting misalignments were part of the traditional Manchu archer's set of basic skills. Another challenge is the stringing process. The ears may even out the force draw curve when pulling the string, they are of no use during stringing process because you grab the bow at its knees when stringing. As a consequence, archers can often shoot a much heavier Manchu bow than they can string ! For heavy bows, they would use bending blocks to bend the bow limb by limb before installing the string. Manchu officer Wu Fu carefully checking the alignment of the ears on his bow. From a late 18th century portrait. "In regularly held contests, expertness might be demonstrated by accuracy of aim, length of shot, or strength in drawing. It was the last of these that occasioned the most detailed comments by supervising officers. Bows were graded by "strength" from three [40 pounds] to as high as eighteen [240 pounds], according to their stiffness. Ability at strength of six (probably a pull of about 80 pounds) was considered minimal for a grown man, and strength of ten (about 133 pounds) was required for participation in hunts. A 1736 report found that of 3,200 troops at the Hangzhou garrison about 2,200 were able to draw bows of strengths six to ten [80-133], and 80 could handle bow strengths of eleven to thirteen [147-173 pounds]… …In comparison, the 500 troops at the small Dezhou garrison acquitted themselves with honor, all of them being able to take a five-strength bow [67 pounds], 203 a six-strength [80 pounds], 137 a seven ­strength [93 pounds], and 85 a ten-strength bow [133 pounds]. Manchu bows, if properly made, enable very long draw lengths of 36" and beyond, but they are shot at slightly shorter draw lengths. Especially at the higher draw weights your draw length in a given posture will be reduced by a few inches due to the compression of the body's tissue under the bow's weight. 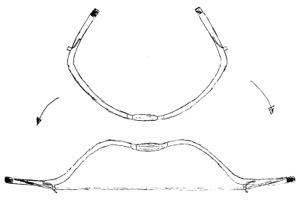 A Manchu bow, top unstrung, bottom strung. All bows are made with a specific purpose in mind. The Manchu bow design is focused on getting good results launching heavy arrows while the trade off is not being able to reach extremely high arrow velocities. It is a good example of the fact that there is no "best" bow, just a bow better suited for a specific task. 1Stephen Selby, CHINESE ARCHERY, Hong Kong University Press, Hong Kong, 2000. P. 348. 3From Elliot, Mark C, THE MANCHU WAY: The Eight Banners and Ethnic Identity in Late Imperial China. Stanford University Press; 2001. My own conversions in brackets. I further elaborate on Qing military draw weights in my article A PRACTICAL GUIDE TO MANCHU MILITARY ARCHERY, Journal of Chinese Martial Studies, Winter 2012. Issue 6. Three-In-One Press, Hong Kong. 2012. 4Thanks Magén Klomp of Fairbow for pointing that one out to me. The Visible Bow Cross-section analysis of a traditional Chinese bow by Stephen Selby. Interview with Wu Yonghua Interview with the daughter of the last bowyer of Chengdu by Stephen Selby. Ottoman Turkish Bows An authoritative work on Ottoman bow design, construction and performance by Adam Karpowicz. Chiung, T'an Tan: INVESTIGATIVE REPORT ON BOW AND ARROW MANUFACTURE IN CHENGTU, Reprint, 1981.